Determining where, when and why fish move is critical in understanding the distribution and availability of fish for fishing, and forms a basis for the sustainable management of fisheries. How do we track the movements of fish? Until recently, the movements of fish have been investigated using conventional tags and catch/release fishing. Which species of fish are being tracked in Victoria? Scientists from the former Department of Sustainability and Environment have tracked the movements of black bream and dusky flathead in the Gippsland Lakes, and black bream in the Yarra/Maribyrnong estuaries. A silent video clip showing black bream swimming in an area of woody debris in the Gippsland Lakes. Click the 'play' button and the video should display directly in your browser if this does not happen you may need to reload the page. A further selection of video clips showing bream in the Gippsland Lakes is also available within this section of the VRO. What to do if you catch a tagged fish? 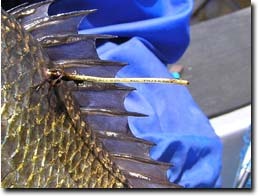 All fish implanted with an acoustic transmitter have also been tagged with an external tag. Assistance with fish tracking projects and pictures used in this site supplied by.